My beloved John and I took the opportunity to visit the Wildlife Conservation Centre in Sungkai when vacationing nearby at Felda Residence Hot Springs last December. We almost couldn’t locate the place as the receptionist at Felda Residence Hot Springs sent us on a merry-go-round when she directed us to the Convention Centre of Felda Residence Trolak instead! Gosh…how could she had mistook ‘conservation centre’ as ‘convention centre’ which has no relevance to wildlife at all? Anyway, we did manage to reach our destination almost noon after asking for the correct direction from some locals at Trolak and Sungkai. 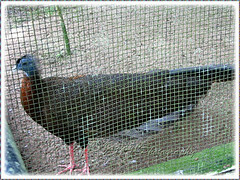 Known as Pusat Pemuliharaan Hidup Liar in Malay, Sungkai Wildlife Conservation Centre is managed by the Department of Wildlife and National Parks (Jabatan Perhilitan) in Sungkai, Perak. The centre which spans over 50 hectares was opened in 1971 and it’s primary conservation effort to prevent extinction of endangered wildlife is focus on captive breeding programmes for the gaur, sambar deer and several indigenous pheasant species. Surprisingly, we were the only 2 visitors that noon and nobody was available to guide us around that vast area. I supposed it’s a free and easy tour, where one is expected to do-it-yourself kind of thing. Whatever, we did enjoy our visit extremely, spending about one and a half hours at the wildlife reserve, gazing with amazement and wonder at whatever were available and left happily with some photos captured for remembrance. 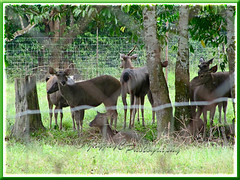 The spacious wildlife oasis with lush green surroundings and huge shady trees is just perfect for the Sambar deers, seen roaming unrestrained and appeared so at home, as if in their own natural habitat. The Malayan subspecies of sambar is the smallest in body and antler size as compared with the Indian Sambar Deer or the Sri Lankan ones that are rated as the largest in the genus ‘Cervus’. 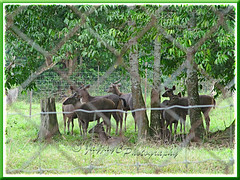 What a pity that we missed out on the Timor Deers and Mousedeers, being unaware then of their existence at the wildlife reserve. This extensive wildlife reserve is also a sanctuary for the endangered Malayan Gaur, the largest species of cattle, bigger than the Cape Buffalo, water buffalo and bison. 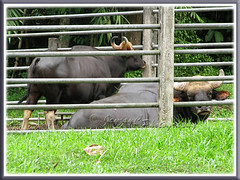 Malayan Gaur or Seladang in Malay, is the smallest among the 3 subspecies of gaur that includes the Southeast Asian Gaur (Bos gaurus laosiensis) and the Indian Bison (Bos gaurus gaurus). We were advised by one of the staff not to get too close as these huge and gigantic animals can be easily agitated with unfamiliar scent and faces. They looked threatening, no doubt about that. But, being properly contained within iron fences, we were a little brave to move close enough to marvel and enjoy them! 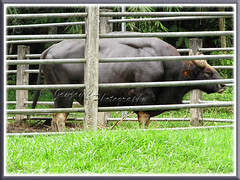 Looking like water buffalo in front and like the domestic cattle at the back, they appear menacingly powerful with a highly muscular body and a pair of horns at both sides of the head. Both sexes have these horns that curve upwards and bend inward and slightly backward at the tips. The bulls are substantially larger in size than the cows. 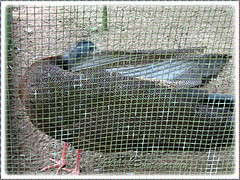 This area was quite a disappointment as the huge cages that housed these beauties are covered with tightly spaced wire-netting materials that not only hinder proper viewing but photography too. 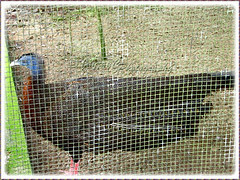 Rather frustrating as we were unable to enjoy the full beauty of these birds and have clear shots of them. The Great Argus (Argusianus argus), was such a delight to watch. Frequently opening its beautiful and fabulously patterned wings to show off, as if displaying specially for us. Simply lovely! This pheasant is large, measuring up to 2 m in length, with long tail feathers and secondary wing feathers that are distinctly decorated with large eye-spots. Plumage generally rusty brown with intricate pattern and spots of chestnut, brown, white, black and grey. 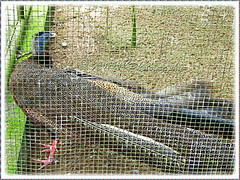 It has a small head with blue bare skin on its head and neck, short black crest, rufous red upper breast and red legs. Sorry, no hornbill pictures to share here except the one below but you can enjoy them at Hornbills Photo Gallery by Wong Tsu Shi. 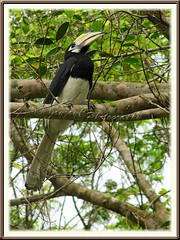 An Oriental Pied Hornbill suddenly flew overhead and landed on a tree branch within our view unannounced. How very fortunate! I was extremely thrilled and happy…gotcha on candid camera! Distribution: Bangladesh, Bhutan, Brunei, Cambodia, China, India, Indonesia, Laos, Malaysia, Myanmar, Nepal, Singapore, Thailand and Vietnam. Habitat: Tropical and subtropical moist lowland forests. Take the North-South Highway and head for Sungkai toll exit 128, then turn right at the junction which will lead to Sungkai town. 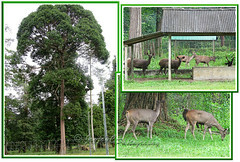 Sungkai Wildlife Censervation Centre is located about 15 km from Sungkai. Look out for the Menderang signage on the left and a little further the Shell Petrol Station on the right. Turn right before the Shell station and just continue traveling the narrow and dusty road until you notice the signage of Sungkai Wildlife Conservation Centre welcoming you in. White-browed Bulbuls zeroed in on our Java Apples! Jacqueline, I didn’t know that there is such a place in Sungkai! I have been travelling to and fro Ipoh and yet don’t know about it. I want to see the hornbills and these special animals. Thanks for the contact and info. You’re most welcome, Autumn Belle! Hope you get to see this lovely place one day soon. I don’t think many of our country folks are aware of its existence too…us included until we booked online to spend a short vacation at Felda Residence Hot Springs at http://www.plantationresorts.com.my/HotSprings/index_ap.shtml and saw a link to nearby destination. i’m a native of sungkai.would be happy and glad to show visitors around sungkai. Hi, my family plan to take a night train from Singapore to KL, then KL to Sungkai. We intend to stay at Felda Residence for 2 to 3 nights. After that we would like to visit the lost world of Tumbun. May I know if the lost world of tumbun near Sungkai? How do we get there? The Lost World of Tambun is in Ipoh, Perak. Check out its official site at http://www.sunway.com.my/lostworldoftambun/parkinfo_getHere.asp for direction please. We’re unable to guide you positively as we’ve never been there before. Wishing you and family a pleasant and enjoyable vacation in Malaysia, Lee! Do we need to purchase ticket to enter the Wildlife Conservation Park, and how much?